Have you ever really thought deeply about what the human mind is and how it functions? You can talk to 100 different people and ask them what the human mind is specifically and chances are pretty good that you'll receive at least 98 different answers. Although, that may not surprise you, what may surprise you is the fact that those who practice conventional methodologies related to the mind such as psychiatry, psychology etc. can't accurately tell you what the mind is either. They treat what are often times referred to as mental illnesses without knowing or being able to accurately diagnose what a mental illness is and treat those with emotional traumas by having patients go back in time, dwelling on and reliving unpleasant and traumatic experiences. They're taught to prescribe pharmaceutical drugs to slow the functions of the brain often causing greater and more serious problems than the issue being treated. The sad fact is, the majority have no idea what the mind is, how it operates or how to properly and effectively treat those who experience what professionals might refer to as chemical imbalance or mental illness when they "diagnose" and label someone with one or more of over 300 labels that are referred to as mental illness. The truth of the matter is, mental illness isn't really an illness at all. There is no virus or bug that causes mental or emotional instability. Like many "conventional western medical practitioners" many psychologists and psychiatrists attempt to treat mental and emotional irregularities with bandaid type approaches and in so doing never get to the core of and address the "real cause" creating the ailment. Whether it's emotional trauma, stress, anxiety or other irregularities resulting in abnormal behavior patterns, the all too common "quick fix" results in prescribing some synthetic and often times harmful pharmaceutical drug. The human mind is not a "physical organ" and the functions of the brain are controlled by the mind. The brain in turn is the driving mechanism that determines what happens in the body. But the origin of ALL things in life...whether relating to the body or any other "physical thing" that we experience in life is without fail derived from the "mind" at either a conscious or subconscious level. You could say that all things...ALL things are the result of consciousness. This "includes" emotional and mental irregularities. Although drugs do often create a drug induced euphoria, side effects and long term damage are far more prevalent than most understand or are willing to admit. When it comes to dealing with issues relating to the human mind, there is a far safer, healthier and much more effective way to deal with emotional and psychological issues. It's called developing an understanding of and addressing things at the root cause which in this case is developing an understanding of and knowing how to effectively master the human mind which leads to and enables "Life Mastery" to be achieved. Let's look at that way now. The Human Mind...more specifically the two aspects which collectively make up the human mind, namely the conscious mind and the subconscious mind, once explored and understood, provide tremendous insight and greatly expanded possibility and potential for you individually should you choose to discover the infinite power that the human mind has in determining outcomes in your life. It is a powerfully creative tool that if used consciously can create a life that many would call "heaven on earth." Choosing to develop this awareness regarding the power of your mind will put you far ahead of those who might otherwise "believe" that the various events, conditions and circumstances encountered in life happen as the result of something that is external to them. This understanding combined with a basic understanding of Quantum Physics and what the new science of Quantum Physics has discovered and recently made available, combined with a basic understanding of the Universal Laws which serve as the immutable, unwavering and ALWAYS in operation governing forces of creation, opens new doors of understanding and a DRAMATICALLY enhanced awareness regarding your individual ability to consciously, consistently and intentionally create desired outcomes in your life whether those desires are physical, financial, relational, emotional or spiritual. Although the concept of human mind power has existed, been recognized and even taught by some of the most insightful spiritual teachers for thousands of years, since the release of the blockbuster movie The Secret, which literal millions were exposed to, the concept of individual mind power has become much more widespread and has ignited new hope and promise for countless people around the world. Unfortunately, there are MANY people who misunderstood and failed to grasp what the Secret was attempting to do which was created to serve as an introduction to conscious and intentional creation. There is much more to conscious creation than just kicking back in your recliner, closing your eyes, visualizing and "getting everything you want." Although The Secret did serve as a great introduction to the concept of "conscious creation" as well as the infinite power of the human mind, introducing people to their individual ability to consciously create desired outcomes, there are additional things that need to be addressed prior to consistently utilizing your individual power enabling you to begin "attracting" health, wealth and prosperity to you. Although the Secret did an excellent job describing energy, frequencies and how our individual thoughts and emotions play a major role in the process, what they didn't cover in depth is the necessity to "unlearn" many of the traditionally established "false and self limiting beliefs" that so many have bought into, lived by and developed solidified beliefs about throughout their lives. This quickly emerging field of understanding specifically how the human mind operates and the role the conscious mind as well as the subconscious mind play in determining one's results in life has become an extremely exciting and empowering field of exploration for those who choose to delve more deeply and inevitably as a result, enhance the kind and quality of their lives exponentially whether physically, financially, relationally, emotionally or spiritually. The first step necessary in honing and developing your ability to effectively and consistently utilize the principles shared in The Secret, what is now being called The Law of Attraction, begins by developing a deeper understanding of who and what you truly are and expanding your belief with regard to the power that has been freely provided to you. Once a level of self awareness is established regarding that power you can regard to specifically how the human mind operates and once understood how you can begin to most effectively utilize that understanding to personally experience the limitless benefits that are and always have been equally available to all. These aspects of mind, which as you'll soon discover are intricately interconnected with still other aspects of mind, namely the collective consciousness and the Super Conscious Mind, collectively determine how each and every occurrence in physical form on a global scale comes to be as well as the role it can play or not play in your individual life. The picture displayed above provides a visual of how the conscious and subconscious aspects of mind operate and the role each plays in determining your individual experience. 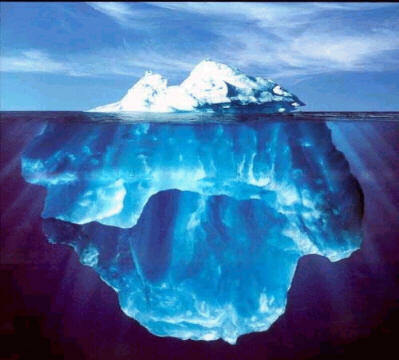 The lower portion of the iceberg represents the subconscious aspect of mind and the upper portion the conscious aspect of mind. It represents that the conscious aspect of mind, which we are consciously aware of is minuscule in comparison to the dominant aspect of the subconscious mind which is said to play the dominant role in determining how approx. 95-99% of the events, conditions and circumstances in our lives unfold. It has been discovered that the subconscious mind serves as the communication device with the metaphysical and/or "spiritual realm" or if you prefer the scientific explanation, the aspect of mind that projects and as a result draws from "The Field", energy frequencies that harmonize with the frequencies created and projected due to subconscious "beliefs" and perceptions held which are the essence of what transmutes from wave form (photons) to particle form (matter) and determines the "physical events, conditions and circumstances that are experienced in the various areas of life. The subconscious is the dominant and most powerful aspect of mind as it pertains to determining what is experienced in an individuals life. The subconscious which is right brained, metaphysical or spiritual in nature serves as the communication device with whatever the the Source of your understanding might be and in essence determines what you are asking to receive which you DO 100% of the time. The subconscious aspect of mind plays the dominant role in determining how each of the events, conditions and circumstances in the various areas of life unfold. The reason that the subconscious is dominant is due to the fact that it houses the beliefs and perceptions established throughout your life and are stored within it which determines based on your individual beliefs and perspectives what is possible or not possible for you in each and every area of your life. The conscious mind, is the aspect of mind that is said to be the left brained aspect of mind and is the aspect of mind that is rational and logical in nature. The conscious aspect of mind is utilized to control the conscious functions of the physical body and utilizes the 5 physical senses specifically to make it's determinations as to what's "real" an "not real", true or untrue which lead to an individuals choices and actions in the physical aspect of their lives. The conscious mind, once determinations are made or judgments are formed with regard to these physical experiences, then stores this data into the subconscious mind which serves as the storehouse of memory much like the hard drive on a computer. Here's where things can become very tricky and without a clear understanding of how the conscious mind and the subconscious mind operate can lead one to believe that they have absolutely no control over their lives. What has been previously stored at the subconscious level, meaning the data that the conscious mind has judged to be "real, valid and true" based on physical appearances is processed and allowed to be stored within the subconscious, which has far greater power in determining ones outcomes. Through repetition these beliefs have become solidified and deeply embedded at this subconscious level which also serve to create physical masses known as dendrites in the neuro pathways of the brain making it difficult to change beliefs when new data is discovered. In other words, if you have been conditioned throughout your life to "believe" that lack, limitation and struggle are a way of life as you were growing up, you hold beliefs in the subconscious aspect of mind that will play out in your life just as you believe they will until a conscious choice is made to elevate and change the underlying and often unnoticed beliefs which are 100% of the time creating those conditions. Unless and until these subconscious beliefs are recognized, dealt with and changed, the physical experiences that you encounter cannot and will not change. Until these beliefs are changed at the subconscious level these experiences in your life will continue. This is where the challenge lies for those who discover what I refer to as a "Higher Truth" and attempt to change the outcomes experienced in the various areas of their lives whether it be physically, financially, relationally, emotionally and/or spiritually. Although you can develop an intellectual understanding of these "Higher Truths", it's very common to find it difficult or in some cases impossible without additional guidance or assistance to elevate these self sabotaging subconscious beliefs which are absolutely essential to change before any change can be experienced in physical form. Although the conscious mind has a willingness to accept this new data, it also makes judgments and determinations based on the physical appearance of the events, conditions and circumstances which are happening all around you in physical form which ignites emotions in the body that are "disharmonious" and repel the "thing" desired, whatever that might be, making it difficult to create and experience the "desired changes" in your life. The difficulty lies in the fact that based on what the conscious mind observes, combined with the data previously stored at the subconscious level which the conscious aspect of mind also utilizes to make it's judgments and determinations, emotions are ignited that conflict with attracting desired outcomes resulting in the attraction of less than desired results. The key to creating positive and desirable change is to go to the root source of the cause...to discover, understand and MOST importantly "apply" effective ways for reprogramming the subconscious. This free PDF report titled Super Dreams System provides some great insight as to how to accomplish that. To effectively shift both the conscious physical aspects of belief which take physical form in the neuro pathways of the brain AND penetrate the dominant subconscious aspect of mind, I've found that choosing both brainwave entrainment as well as a more spiritual form of meditation proves to be VERY effective. Once you truly "get it" and fully understand the power that the mind has over your experiences in every aspect of your life, as exciting as that is, it requires additional support to make the desired changes "real and tangible." Although a very small minority can through sheer willpower alone make these necessary changes, modern day technology and advanced spiritual teachers offer a much faster and far less effortless way to accomplish it. There are some very powerful and effective Brainwave Entrainment Technologies available that make the process much quicker and far more simple than attempting through sheer willpower alone. Brainwave entrainment is powerfully effective in dealing with the self limiting "conscious perceptions" held and provides an incredibly effective tool for creating new neuro pathways in the "brain" (dealing with things at a "physical level") which assist in developing whole brain functioning. Brainwave entrainment basically balances the left and right hemispheres of the brain enhancing intuitive abilities as well as the ability to see beyond the limitations of the immediate "physical environment." For reprogramming the subconscious aspect of mind, a more subtle approach that I've personally found to be not only helpful but extremely powerful is a "specialized form of meditation" rightfully named The Awakening Dimensional Consciousness Guided Meditation System. Guided Meditation provides another alternative that serves not only in elevating and shifting subconscious beliefs, but provides numerous other benefits as well. Copyright © 2005-2008. The Human Mind article and all content on Abundance-and-Happiness.com is the intellectual property of Chuck Danes and Enlightened Journey Enterprises and strictly prohibited from copy or reproduction in any form in whole or in part without the express written consent of the author Chuck Danes and/or Enlightened Journey Enterprises. Any and all violations of these rights will be pursued under strict accordance with U.S. copyright laws. All Rights Reserved Worldwide. Each of the resources recommended in The Human Mind article and throughout Abundance-and-Happiness.com has been personally tested, utilized and approved by the founder as a credible and effective means of accomplishing it's intended purpose. Any and all guarantees are handled through the company that provides the resource.